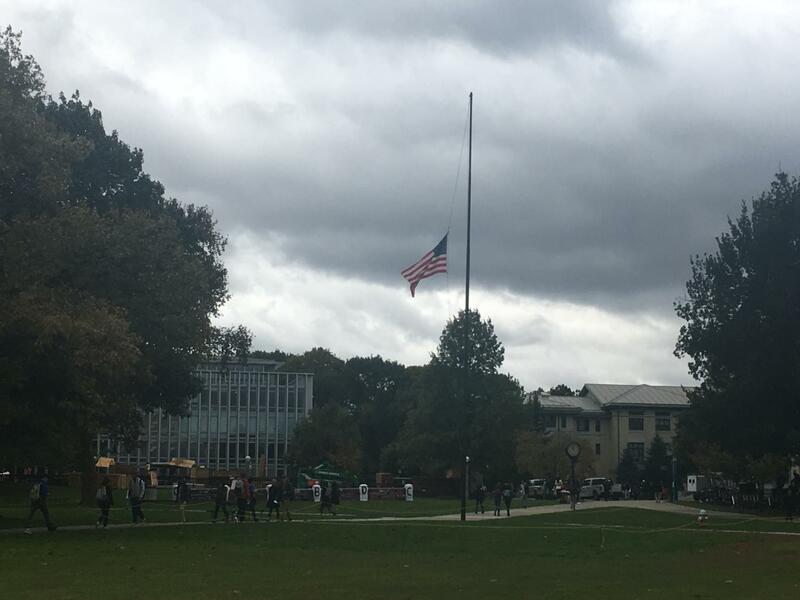 The American flag lowered at half-staff at nearby Carnegie Mellon University. On October 27th, the Jewish synagogue, Tree of Life Or L’Simcha Congregation, in Pittsburgh, Pennsylvania saw a tragic event occur. 46 year old Robert Bowers entered the synagogue and opened fire and continued shooting for twenty minutes after shouting “All Jews must die!” Bowers was armed with a Colt AR-15 semi-automatic rifle and three Glock .357 SIG automatic pistols. It was reported by Huffington Post that around 60 to 100 people were inside the building at the time. Police arrived at the building approximately ten minutes later, where Bowers fired on them from inside the synagogue and injured two police officers. Police would enter the building and engage in a gunfight with Bowers, wounding him but also wounding two officers. Bowers would surrender from a room he was hiding inside of while stating that he wanted “All Jews to die,” and that the Jewish people were “committing genocide to his people,” according to a criminal complaint. Eleven people were killed in this attack and six were injured, including the four police officers. Bowers was charged with 44 federal crimes, including murder, hate crimes, obstructing the practice of religion, and many more. According to CNN, 32 of these charges are punishable by death. Bowers has pleaded not guilty. All of this occurred just a few days after October 22nd, where a pipe bomb was found at the home at the home of George Soros, a billionaire Democrat. At least fifteen more of these pipe bombs were found throughout the week at many well-known Donald Trump critics and famous Democrat’s homes, including Barack Obama, Hillary Clinton, Joe Biden, and actor Robert De Niro. A package was also addressed to CNN’s world headquarters, but was found at an Atlanta post office. It is good news that none of the devices exploded and nobody was harmed. Cesar Sayoc, a 56 year old Florida resident with a criminal history was arrested on October 26th and charged with five federal charges. Sayoc could face up to 48 years in prison if convicted. With all of these events that have happened in our country’s recent history, it leads one to wonder: has this become normal? Have we grown used to the idea of tragedies occurring based on how often they have occurred? How safe are we even in our society? According to senior Alex Arnold, he feels safe in Milford because he doesn’t “feel threatened because of the community we live in.” This helps show that these events may not hit the people of Milford as hard as people in more dangerous cities, such as Detroit or Pontiac. Students in those cities may fear these sort of events occurring in their communities every day. “I would feel safer in more dangerous communities if I could carry a gun,” said senior Tyler Knapp. Many Americans share this belief, but gun control has been an issue in our country for years now, and its issues do not seem close to being resolved. When talking about these events that have occurred, people have had mixed feelings. Knapp put it simply when he said, “People are sick.” This truly shows how many of these events occur throughout our country due to one person’s mental health issues. According to Katelyn Newman of the US News, we have made progress in youth mental health proceedings. As seen in studies, “The rate of mental health-related visits increased from 50.4 visits per 100,000 in 2012 to 78.5 per 100,000 in 2016.” This shows the progress our country is attempting to make on the issues faced today, and that we are trying as a community to recognize our issues and make sure our children are healthy mentally. Some worry that these sort of problems are seen too often, as Arnold stated when talking about these aforementioned events that, “It feels like this is normal, and that is a terrible thing.” This statement embodies America right now. We need to make these events less common, we need to make sure we truly change as a society for the better. It will never be perfect, we can’t fully eliminate any tragedy, but we can try our best to increase our country’s mental health and awareness to be able to recognize the warning signs of those who may commit these disastrous acts. If we can do that, our country will improve as a whole, and millions will no longer live in fear.